Views!!! This unit is situated on the far South West of Skyland Village Development. 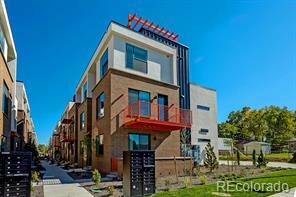 Live in the heart of Denver with City Park just blocks away. Unit has private feel with all the amenities of the development. Easy access to public transit, easy commute down town and I70. This 3bd, 3bth unit has three suites on three separate floors giving endless possibilities to home office/guest bedroom/privacy/home theater and much more. Roof top deck has 180 degree views of the mountians to the West with the Denver down town cityscap in the the foreground. Fixtures for hot tub and gas grill. Sunsets are spectacular! Plenty of windows throughput unit gives a bright feel to the place.